Hip-hop star Nicki Minaj makes her mobile game debut, a version of 'Kim Kardashian: Hollywood' but with a way better soundtrack. Unlike Kim Kardashian, Nicki Minaj is actually famous for something: Her music. So, it makes sense that her new mobile game makes the most of it. Available Wednesday, Nicki Minaj: The Empire is the latest fame simulation game from Glu Mobile, the makers of Kim Kardashian: Hollywood, Britney Spears: American Dream, and Katy Perry: Pop. (Sense a trend?) You can download the free-to-play game now for both iOS and Android. Just like in these other celeb-driven games, you get to virtually hang out with Nicki Minaj and enjoy the perks (also virtual) of being rich and famous. But Nicki Minaj: The Empire also incorporates the hip-hop star’s music throughout the game, even letting players record their own raps over exclusive beats that sound straight out of Billboard’s Top 100. The game starts with you getting to perform “Super Bass” alongside Nicki Minaj in a stadium concert. 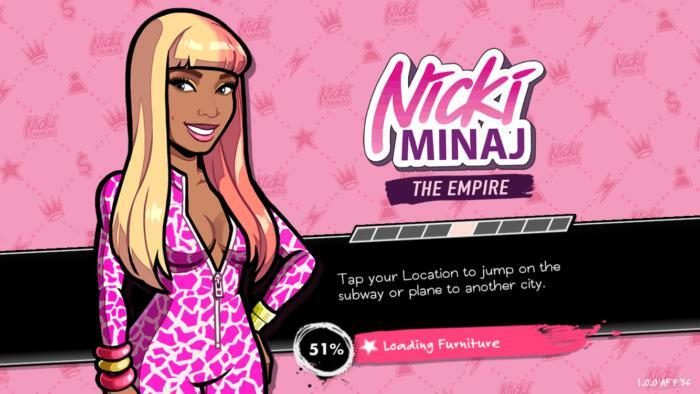 If it sounds like a dream come true, that’s because it is—story mode in Nicki Minaj: The Empire starts out with a dream sequence, which only makes the proceeding storyline somewhat tedious. After meeting Nicki Minaj, you have to write and record a single, put up with the antics of your rap nemesis, and get people to “like” your song. There’s a lot of this manufactured storyline you have to go through before you get to wear the cool clothes, decorate your mansion and throw house parties, and perform at all the big venues. The point here, I guess, is that fame does not come easily, but considering this is a mobile game that stemmed out of fascination for Kim Kardashian, maybe the fame perks could come a little sooner. For once, can players just start out being super-rich and famous? You know, kind of like the young Kardashians? The best part of the game, and what sets it apart from Kim K.’s version, is the integration of the music. 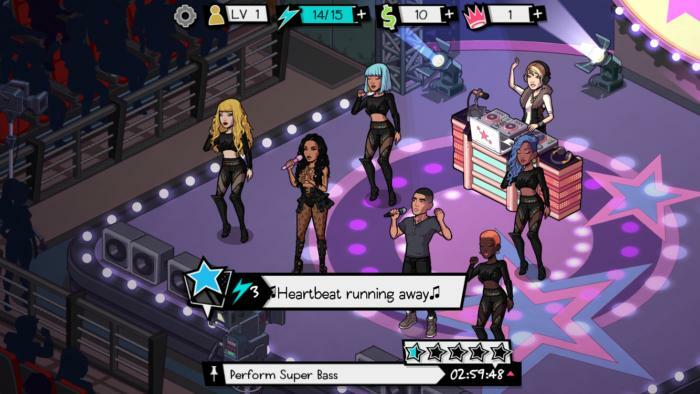 Although Glu has released games for other pop stars like Britney Spears and Katy Perry, it’s the Nicki Minaj installment that has put music at the forefront. On a basic level, the game’s soundtrack consists of Minaj’s most recognizable songs in instrumental form, which fans will certainly appreciate. 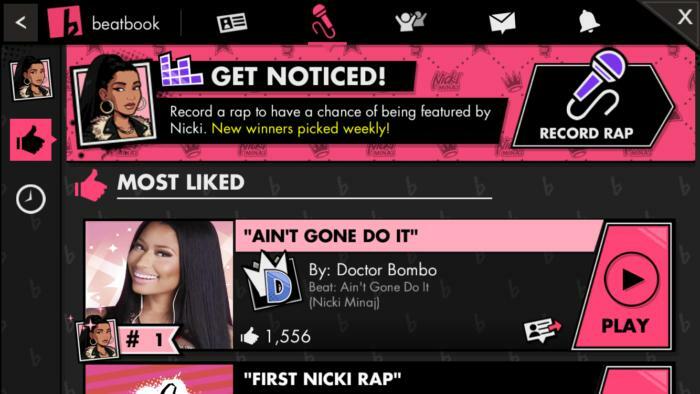 Most impressively, Nicki Minaj: The Empire incorporates a song-sharing social network called the Beatbook. Think of it as the game’s version of Soundcloud for emerging rappers: You get to pick a professional-sounding beat and record your own rhymes. You can also browse through other people’s songs and give them a thumbs-up. At first, I was afraid that listening to user-uploaded raps would be a cringe-worthy exercise, but even during my beta test the most-liked list had a few that were actually pretty good. Nicki Minaj: The Empire also has a bunch of chatrooms, so you can get your “friends” to “like” your songs and climb up the music charts. However, I find these social features in mobile games to be rather forced, but I guess that’s just part of the fame game—you have to learn to be a little fake. This story, "Nicki Minaj's mobile game is about the music, not just the Kardashian-style fame perks" was originally published by Macworld.